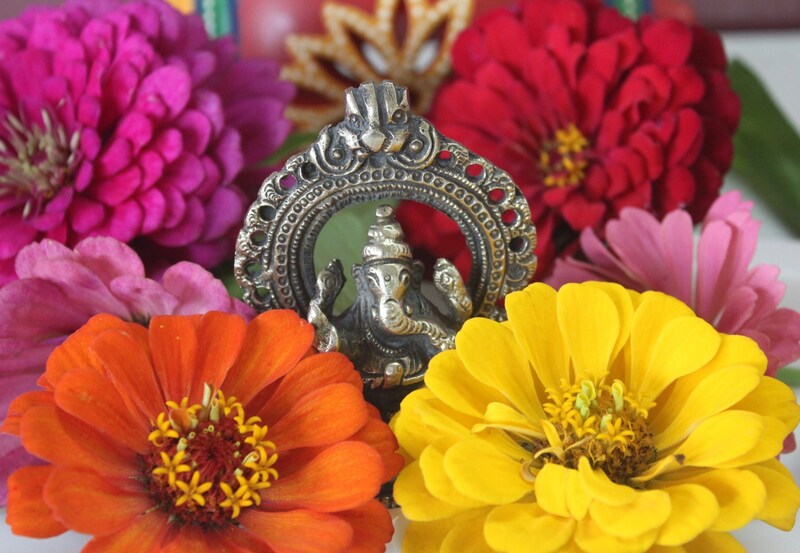 Pillayar Chathurthi, Ganesh Chathurthi or Vinayaka Chathurthi is being celebrated today. The Gods we worship have different names in different parts of India. Pillayar in Tamilnadu is also called as Ganesha or Vinayaka, followed by a list of many other names. Different names don’t interfere in the festivities on the street and inside homes. What the elephant-headed God, being Pillayar or Ganesha likes is fixed – Kozhukkattai in Tamil and Modakam in Sanskrit. 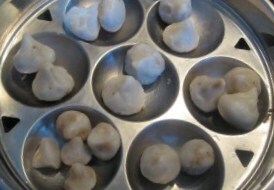 Different Forms of Modak are the most important preparation of Pillayar Chaturthi. Added to the well popularised Modakam in the God’s hands, is a long chain of local ingredients – fruits, vegetables and grains that come up during the season. c. Pori – Puffed Rice. This also shows the socioeconomic connection behind these religion based celebrations. The major crop of the area – Rice and its different versions, has been adapted as ‘Festive Food Essentials’. I often think, if Ganesh Chathurthi had been celebrated elaborately in the northern parts of India – Wheat based specialities would have been his favorite, wheat being the major crop of that part of the country. 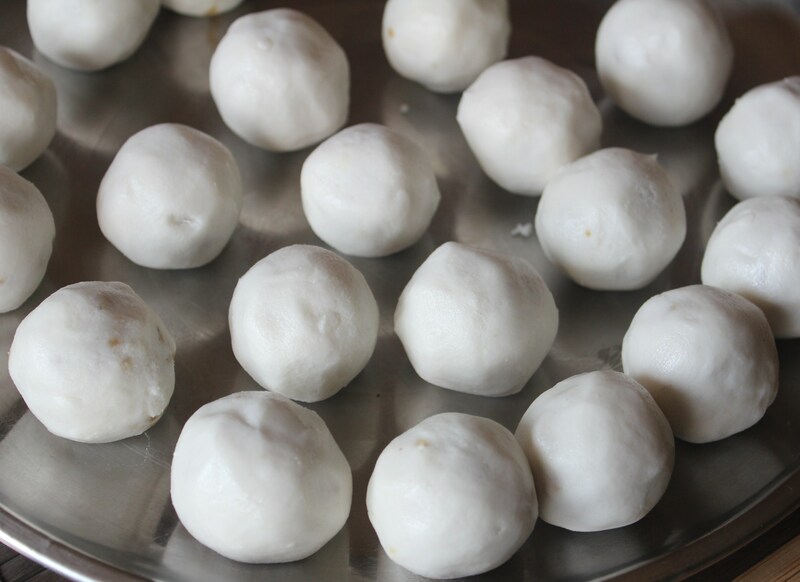 Now, the core ingredient of Kozhukkattai or Modakam is the rice flour. What enters into the beautiful rice cover can be optional. Coconut – Jaggery is the ultimate killer combination of all kozhukkattais according to me. The next classic filling is the Sesame Seed – Jaggery combination. 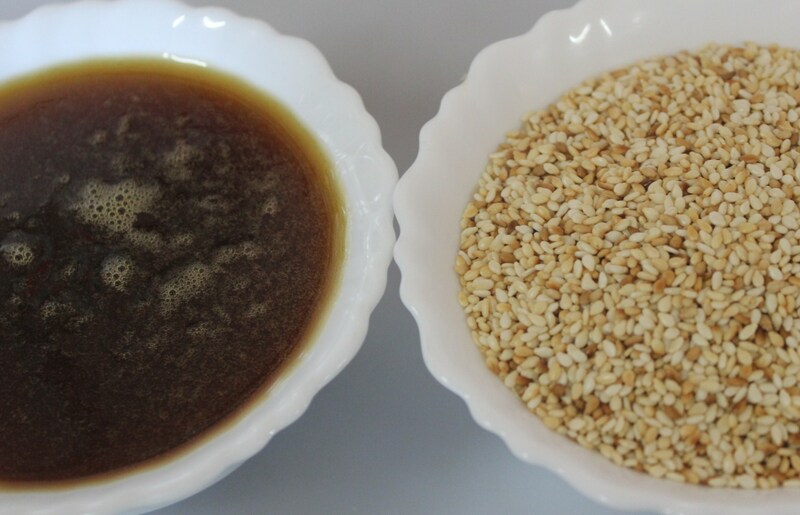 The nutty flavor that the sesame seeds give and the traditional sweetness from jaggery can also be a low-fat version for those who feel coconut or fried coconut is rich in cholesterol (not me). 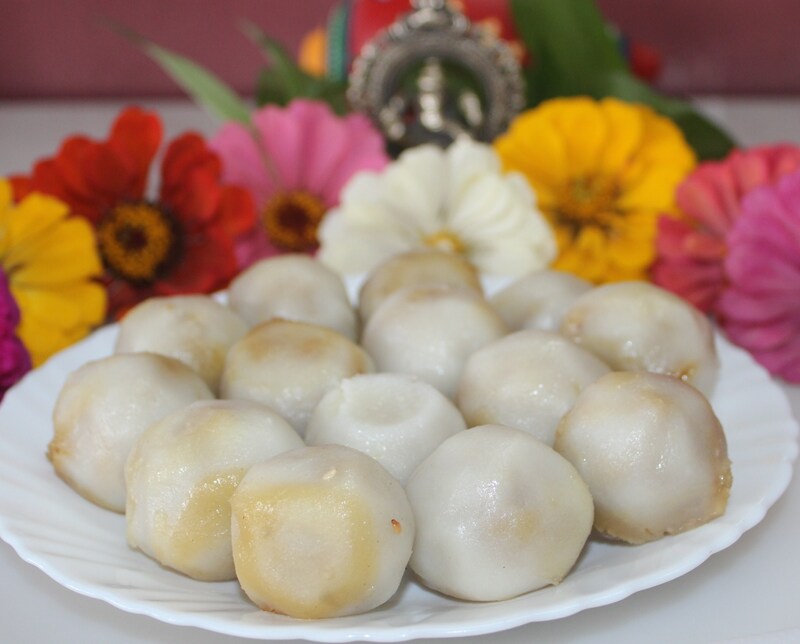 Apart from this stuffed modakams, there are also varieties of non-stuffed stuff – pidi kozhukkattai or plain sweetened or salted steamed dumplings pressed with the impression of fingers – that aid additionally as quick and easy evening snacks. 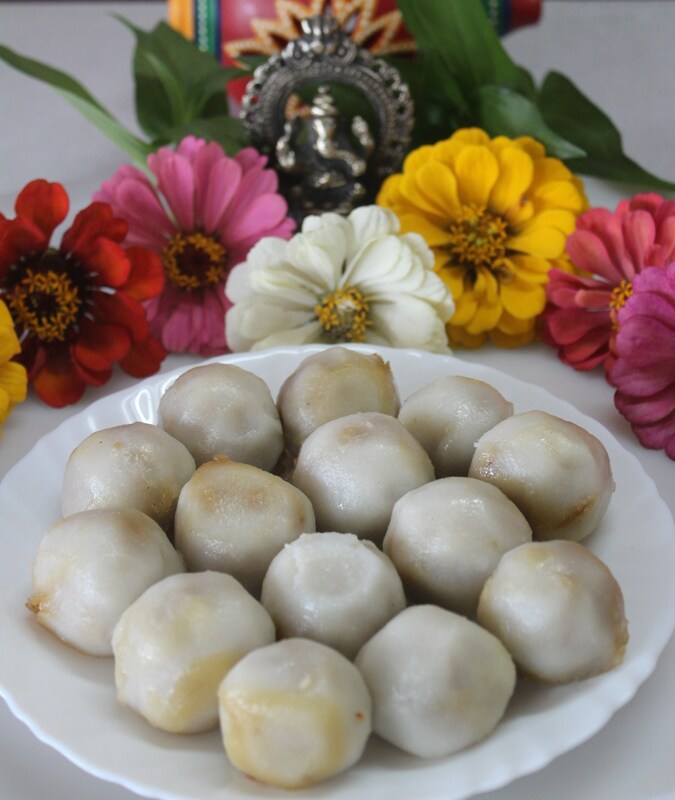 Coconut-Jaggery Kozhukkattai and Pidi Kozhukkattai – Sweet and Salt and Spicy versions, have already been posted. 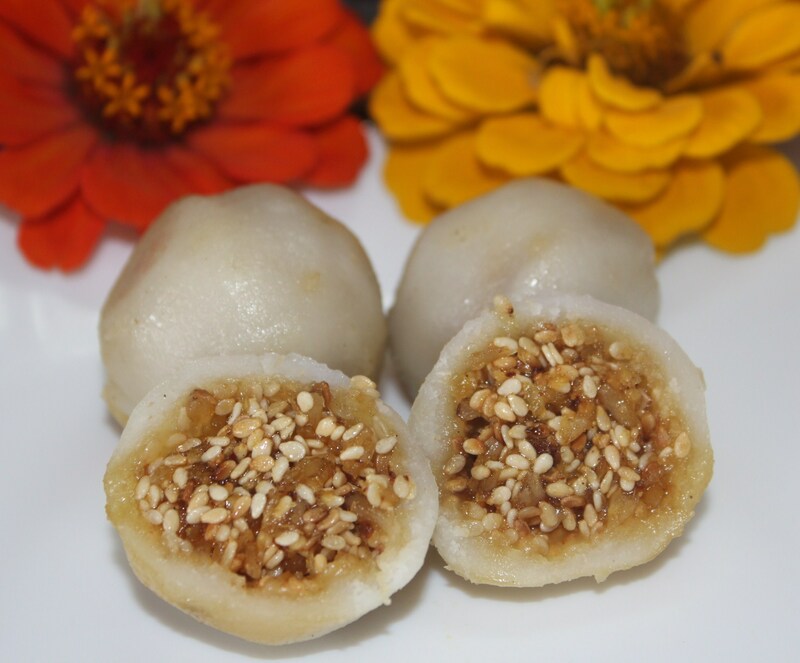 It’s time for Ellu Kozhukkattai or Sesame Seed-Jaggery filled Dumplings this time. Add the gingelly oil for smooth consistency. mixed with coconut, dry ginger powder and cardamom powder..
and shaped to be filled..
Dry roast clean/non-muddy sesame seeds till golden. Separately dry roast coconut – for 10 mins – with the coco-nutty stickiness intact. Dissolve jaggery in just enough hot water and filter the mud that is present. 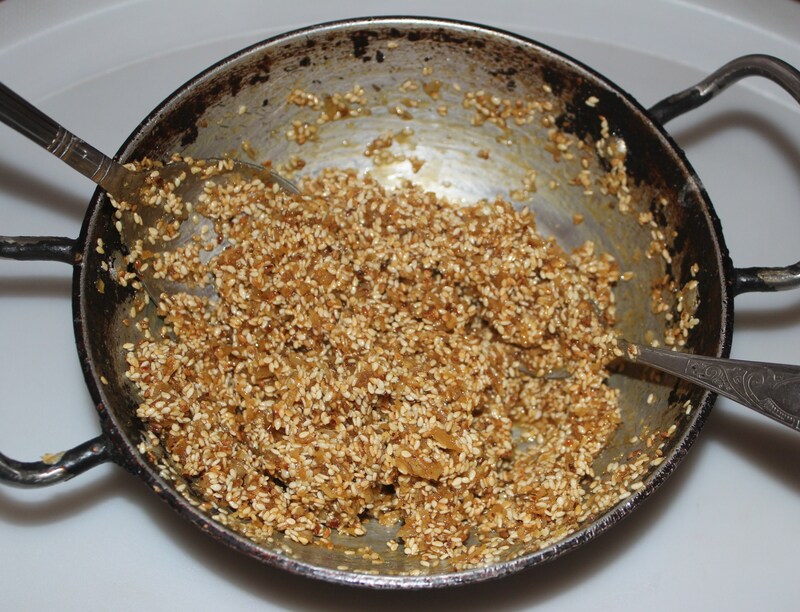 In a pan, heat together sesame seeds, grated coconut, jaggery water, dry ginger powder and cardamom powder. Let the mixture thicken, ready enough to make small stiff balls. Make equal sized balls for filling. Make small equal sized balls for the outer covering. 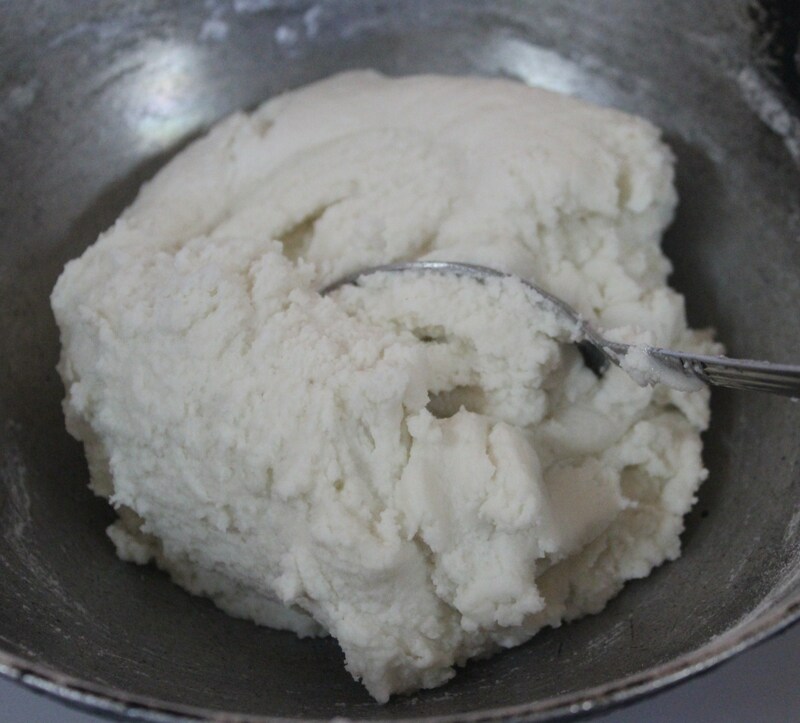 Keep a bowl with 3 tsp gingelly oil for greasing palm – this helps the rice dough not sticking to the palm. Grease palm with gingelly oil. 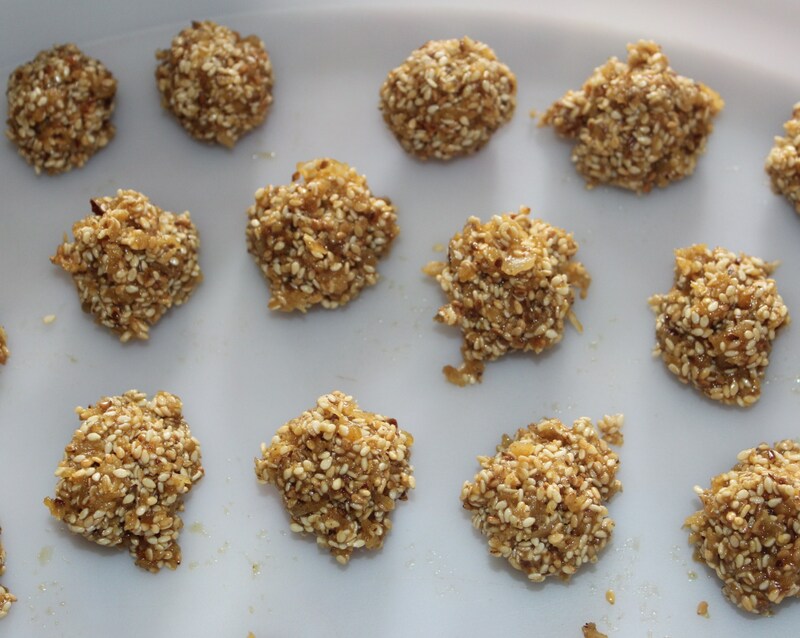 Take one rice ball and press it flat in the palm and fill it with one sesame jaggery ball. Cover it well and make kozhukkattai/dumpling. Make all dumplings to be steamed. Take an Idli Kopparai/Idli Cooker or any Steamer. Boil water in the base of the steamer. Oil the moulds and place the kozhukkattai/dumplings. Place the mould in the steamer and steam for 15 minutes. Kozhukkattais are ready to be served.